The 2016 Olive Harvest Adventure was filled with Festivals, Food, and Fun. The seasonal products in autumn are my favorites: truffles, chestnuts, porcini mushrooms, vino novello (the new wine) and especially, olio nuovo (the new olive oil). It is also the season for wild boar, pheasant, and rabbit. 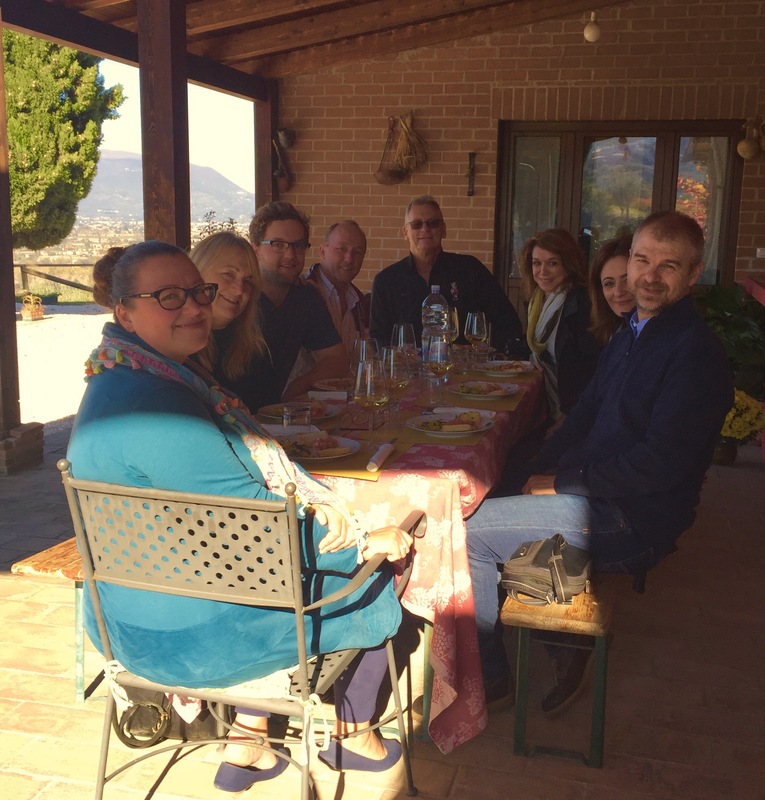 In addition to harvesting olives for 1/2 day and visiting a frantoio (olive mill) to see the olives to olive oil process, here are some additional highlights from our adventure. Panicale is a spectacular medieval town completely surrounded by a stone wall. 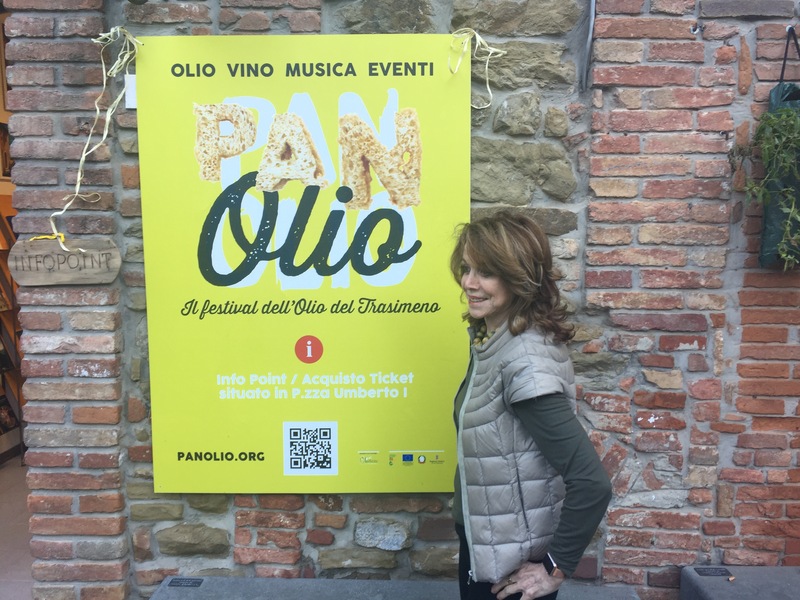 Recently featured in the television show, I’ll Have What Phil’s Having, Panicale’s main activities occur in the town square, Piazza Umberto. For the PanOlio Festival, the piazza was decorated with olive trees. The Festival was held from October 28-30. We went on Saturday evening, as the sunset and into the night to enjoy the lively music. We bought our tickets at the Commune di Panicale in the piazza. Our entry included 12 perforated tickets, an empty wine glass and a handy neck holder. We visited 12 individual taverns or lounges. Most of the taverns were artisan homes, some subterranean, and all beautifully adorned and featuring Extra Virgin Olive Oil from the Lake Trasimeno area, Wine and Umbrian foods. After tasting, eating, and drinking our way through the village, we listened and danced to rock bands, folk bands and jazz. Deruta is a small hilltop town and has been known as the ceramics capital of Italy for over 600 years. 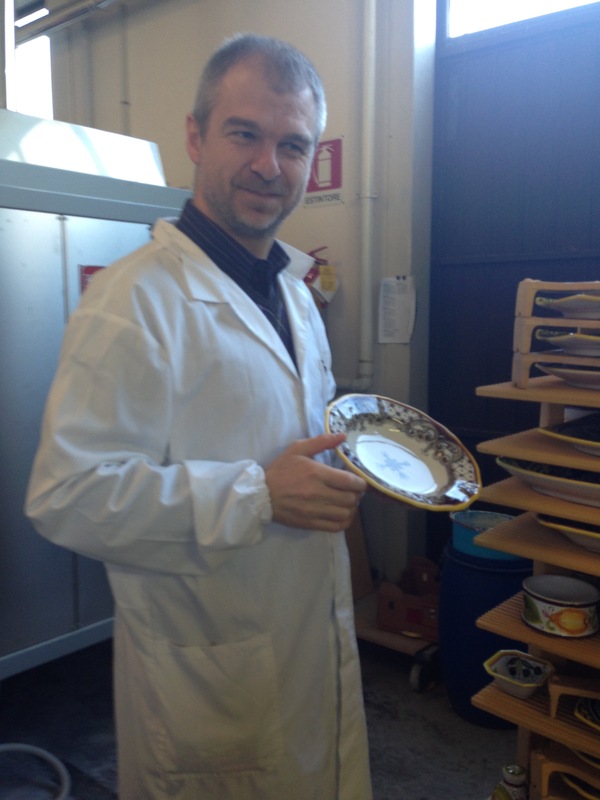 We visited Maioliche Artistiche Tassi, a small, unique ceramics workshop. 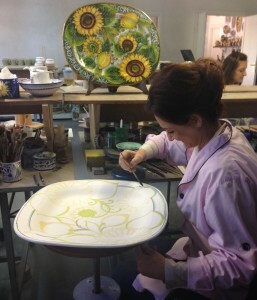 The owners, Marco and Valeria Tassi took us on a tour of the factory explaining the five traditional steps in the maiolica making process from preparing the molded clay to the firing to the glazing to the painting to the second firing. 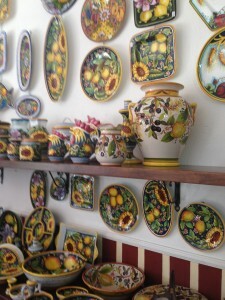 We also visited their showroom featuring the vibrant ceramics pieces. 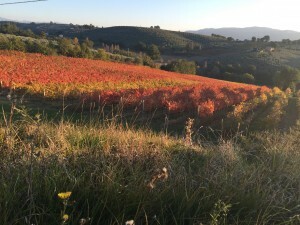 Romanelli Farm is situated on a hill near Montefalco. The view from the courtyard spans all the major hill towns between Assisi and Trevi. The family-run organic winery produces excellent wines and extra virgin olive oil. We sat outside for our 5 course “light” private lunch and tasted the paired wines. We tasted Sagrantino di Montefalco (both dry and sweet versions), a Montefalco Rosso, Grechetto, and Predara Rosso. With over 3000 olive trees, we also tasted both Olio Nuovo (the new oil) and 2015 blend which was still robust. The olive oil is certified organic and includes a single variety San Felice, a single variety Moraiolo and a robust blend of Leccino, Frantoio, San Felice and Moraiolo. On the drive back to Montefalco, we stopped to view Sagrantino vineyards with all their beauty as the sun set. 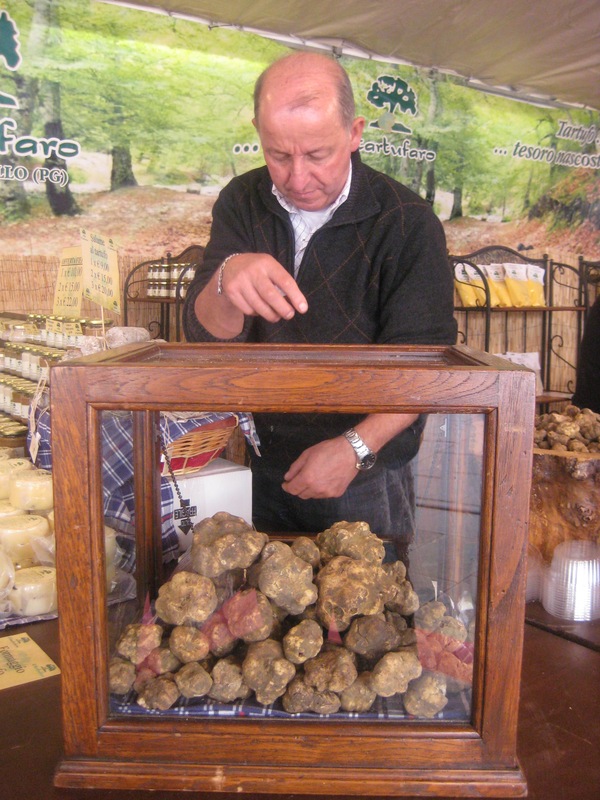 For the past 37 years, Città di Castello has celebrated the White Truffle Festival. 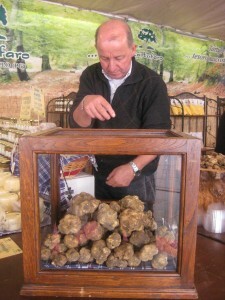 Held in the historic center of the medieval town, this event celebrates the white truffle and other seasonal products. Truffles (tartufi) are mushrooms that are rare and have a unique taste. 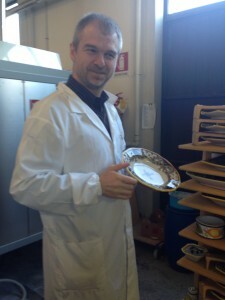 There are black truffles and white truffles, but the white are more precious. Artisans from all over central Italy sell different products at the festival, but the truffle reigns supreme as we learned about the different types of truffles (white, black, summer black, winter black, smooth black, common black and musky). We heard how to use them in sauces and how to use truffle-flavored oil. Some food stands handed out recipes, including those for canapés, omelets and pasta. 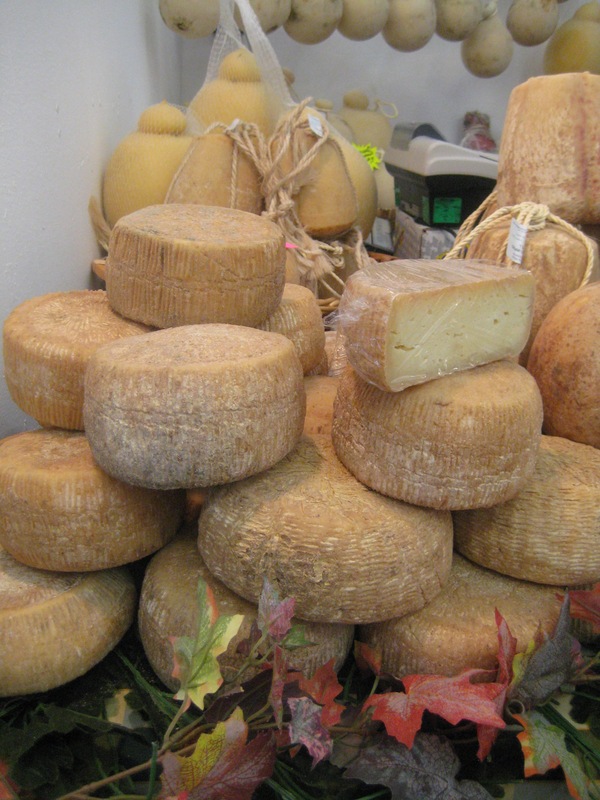 In addition to truffle stands, artisan food sellers featured different pastas, cheeses, salame, honey, wild berry jams, loaves of bread, wild boar, prosciutto, limoncello candies and wine. 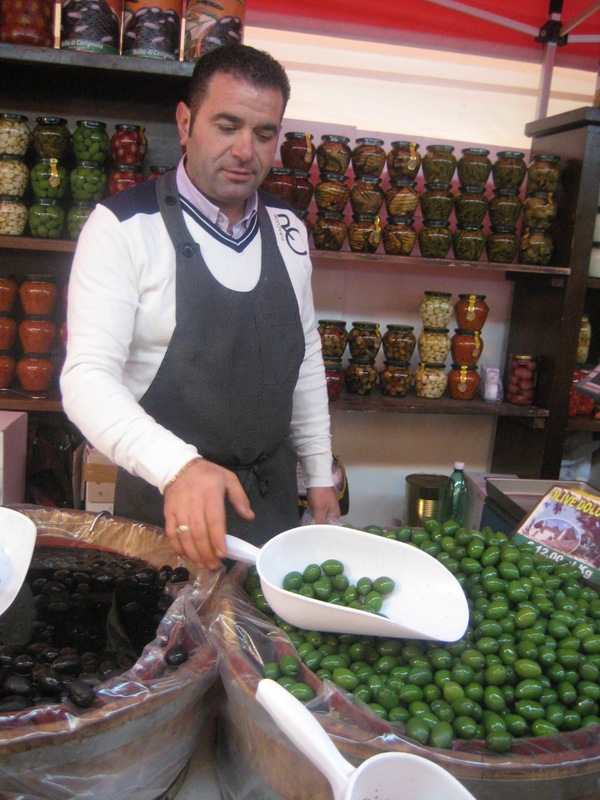 There were huge tubs of different types of olives, a building devoted to the new olive oil and outside cooking demonstrations. Large samples were offered at every food stand and we tasted white and black truffle pates, cheese, olives, pasta and the new olive oil on bruschetta. Some washed it all down with wine! My favorite is Sangiovese.